While I find traveling thrilling, I almost enjoy the art of planning it even more: who wants to return home only to realize that there may have been something super cool that you missed?! A bunch of people have asked about our itinerary, so I’m plunking some of the major pieces here in this blog post for my fellow travelers, Potterheads, and Whovians in case you’ll find it helpful. I don’t care if it’s ‘just’ a tea room. There’s something very magical about knowing this is one of the places where Harry was written into existence. I would describe myself as a casual Doctor Who and Torchwood fan. My friend Sole definitely has me beat in this category. In fact, she has a TARDIS in her front lawn! However, I’ve taken on the very difficult task of watching most episodes of Doctor Who in order to have a better understanding of the characters and storylines. The Doctor Who Experience without walking around in a confused state. This will give us the chance to see the sets, props, and costumes used when filming the series. In addition, there’s a chance some of the cast may be there! Torchwood is a spin-off series from Doctor Who filmed primarily in and around Cardiff. The Hub, or headquarters, is ‘secretly’ located just under the Millennium Centre in the heart of downtown. There’s not an actual exhibit to go see, but we’re going to run around town seeing a bunch of filming locations. And, um, that’s about all I know about that… Better go watch some more TV. On a non-TV note, also in Cardiff is Roald Dahls Plass, a plaza named in honor of my favorite children’s author (and who just happened to be born in Cardiff). My Matilda tattoo will feel so at home! By some kind of Muggle magic, we happen to be in town while the first-ever Doctor Who Festival is taking place, so we’re going there! No trip to London would be complete without a stop at Platform 9 3/4, King’s Cross station, where all the young witches and wizards hop on the Hogwarts Express! Also on the London docket is the Muggle Tour. Unlike the Studio Tour, this tour covers the real life ‘Muggle London’ locations that inspired certain set designs and were even included in certain scenes. I’m most looking forward to seeing the visitors’ entrance to the Ministry of Magic and the pub that inspired the fictional Leaky Cauldron! 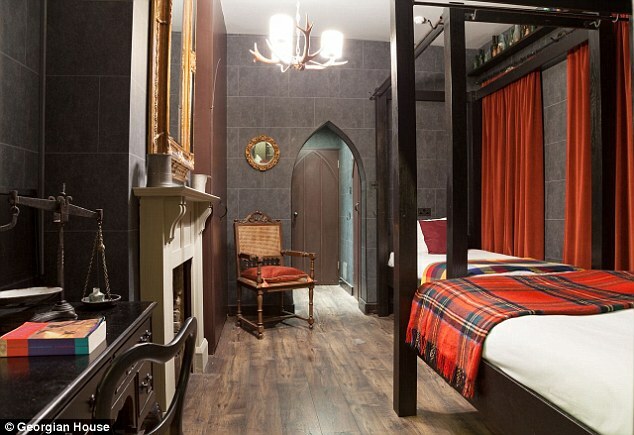 A new addition to the Potterhead dream is the Wizard Chambers at the Georgian House Hotel. Ever wanted to sleep in a Hogwarts dormitory? This is the next best thing! We’re staying in hostels every other night on this trip, but splurged for one night on this beauty. Rumor has it that it’s haunted- I will be spooning Sole all night in fear, just in case!! Staying in a Gryffindor dormitory? Yes, please! Hold the ghosts, though. The impetus of this trip is the Warner Brothers Studio Tour, where much of the eight Harry Potter films were made. While I admittedly prefer the books to the movies, I cannot resist the ability to step into the Potter ‘verse and live it, touch it, breathe it. I was lucky to be here in 2012 and nearly broke down in tears from excitement when entering the Great Hall- and that was just the first stop on the tour! You get to walk around and see a ginormous number of sets, props, costumes, and more! Bonus: this time around, we’re going while everything is decorated for Christmas!!! It’s fitting that this will be the last stop on our trip, as I’m not sure anything could possibly beat this. And there you have it! Nerd-cation, here we come!!! I’m 30! I’m 30?? I can’t wait until Taylor Swift turns 30 and writes a song about how this is supposed to feel. What will she rhyme with thirty? Dirty? Flirty? Qwerty? Being an adult is really hard sometimes- and I’m not just talking about having to make my own dentist appointments! There’s all this stuff I have to do ALL THE TIME: pay bills, buy relatively healthy groceries, prepare relatively healthy meals with a husband that has oddly high standards, ensure that I not blow my entire paycheck before I get paid, work a full-time job when sometimes I just want to stay in bed reading all day… Not to mention all the dumb medical crud that’s swirling around my life these days- doctor appointments and specialists and physical therapy to stave off the knee replacement I may need within the next few years. UGH! But you know what? There’s a lot of really great stuff, too! In the last year, in the last decade, in the last three decades, for that matter, I’ve been very lucky. I feel like writing about 468 pages right now detailing all the experiences that have shaped me over the last ten years, but I’ll spare you the snooze-fest and save the long version for another day and for the memoir that I’ll never actually write. If you’ll humor me, I’m going to list a few of them- not necessarily the most significant and not in any kind of order, but there are a quite a few things that deserve to be revisited. I spent three exceptional months living in Segovia, Spain. We spent little to no time (on purpose) doing homework and instead had time to simply live. Prior to that semester, I was very much a homebody that was too nervous to explore much on my own- and some of my high school friends loved to point it out. Because of that semester, traveling no longer scares me; in fact, traveling is now the #1 reason my bank account isn’t so happy with Adult Holly. I became an auntie. I quite enjoy it. I don’t want my own kids (blah blah blah, you’ve all heard me say that enough), but it’s remarkable to watch these two boys grow up and grow into their own quirky but delightful personalities. I love their enthusiasm for Hot Wheels, good books, and Scooby Snacks- and the fact that my apartment is their Happy Netflix Zone. My heart grows three sizes every time they draw me a new picture. I went to grad school. While graduate school for librarianship is not exactly as strenuous as getting a medical or law degree, it has its own challenges- and yes, you do have to have a master’s to do it! I met some rad people and learned a lot about my craft. Talking information literacy makes me feel alive like few things can. Mostly, I’m happy that I found something that helps me feel more me. I moved to a new state for a good, long while. Most of you that see me on a regular basis know that I still love to dream about the years in which I lived in Colorado. AmeriCorps changes you, just like having 13 roommates in a should-probably-be-condemned house changes you. I did a lot of growing up in those years, and not just because I had to make my own doctor appointments and schedule my own oil changes. I also learned that I better figure out some hobbies, because living in a new state where you know no one is kind of lonely. I made stellar new friends. Throughout my strange college experience and beyond, I’ve made a number of strong, life-giving friendships- the kind in which you can simply look at your friend and you’ll both burst out laughing because you’re both thinking the same thing without even having to say it. No matter their age or how we met, my friends are the best. I discovered cross-stitching. I’m not a super crafty person. If you’re looking for crafty, please kindly introduce yourself to my BFF, Senja, because she can devise just about anything you could ever possibly need. I was not born with that level of skill. One day while perusing the Internet (my favorite hobby), I found a silly little cross-stitch pattern that made me loudly cackle for approximately 18 minutes. I’ll never quite know why this particular pattern caught my attention, but I’m so grateful. A few days after finding that pattern, I embarked on a stitching journey and have not looked back. There’s something about seeing the pattern take shape over time- I love being able to see progress. Plus, the beauty of cross stitch is that you mostly only have to know how to move a needle up and down while following directions! I traveled with my dad. My dad and I haven’t always been super close: he likes cars, sports, and hunting, and I like none of those things. A few years ago I made a flippant comment that he and I should travel together because we at least share the same interest in travel locations, and a few months later we found ourselves boarding a flight. It’s not always perfect (he wouldn’t let me leave the hotel after dark [6:00 pm] because it made him ‘too anxious’), but it sure makes for some good laughs and wonderful memories. Also, I will never stop laughing about the way he can’t understand Scottish English. After that fond trip down memory lane, I think it’s time I get started working on some plans for what the next decade will bring- maybe a 40 By 40 list?